One of the things I enjoy most about woodturning in general and pen making in particular is the extent to which makers are prepared to share their knowledge and skills with beginners and those who are developing their skills. I have gained a great deal of knowledge from demonstrations by professionals and from the members of internet forums so few things give me greater pleasure than being able to repay some of that generosity by sharing my own knowledge. As an established pen maker, I am often asked what seem to me to be quite simple questions but which to the beginner can seem like major obstacles in the way of enjoying their hobby. In this article I give answers to 20 of the questions that I am most frequently asked. 1. 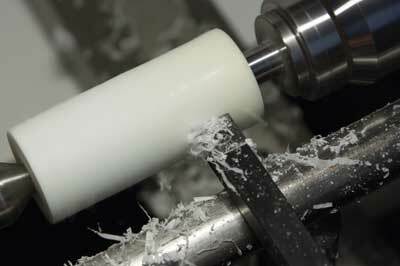 What is the best lathe for pen turning? Try to think ahead when buying a lathe, in terms of the type of work you may wish to progress to in the future and make sure the lathe you buy will meet your needs for many years ahead. While a small lathe is all that is needed for pen making, it is very likely that your interest in turning will develop and you will want to progress to larger work. A lathe is a major investment and, like most things, the old adage of 'buy cheap, buy twice' applies, so make sure that you buy a lathe that is from one of the mainstream manufacturers and of recognised quality. A second-hand lathe of good quality will be a better investment than a cheaper Far Eastern import. A variable speed lathe, where the speed is controlled electronically, will be more convenient than one where the speed is changed by moving the belt between a set of pulleys, but do not trade convenience for quality. A limited budget would be better spent on a good quality belt-driven lathe than one of poorer quality with variable speed. Try to see and handle the lathe before you buy it. Check that it runs smoothly, that the head and tailstock align - centres mounted in head and tailstock should align - and that the toolrest and tailstock slide smoothly on the bed. While Morse taper size and spindle thread are not terribly important for pen making, it makes good sense to choose a No.2 Morse taper and a popular spindle size so that, if you do move up to a larger lathe in the future, you will not also need to change all your chucks and drives. 2. 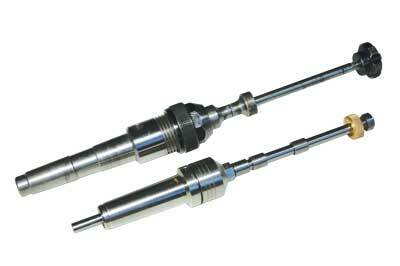 What kind of mandrel is the best? 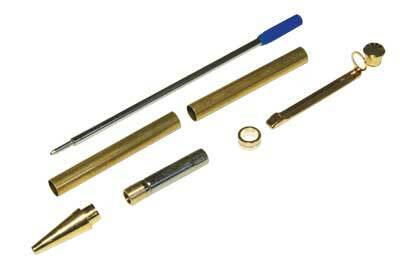 The key factor in choosing a mandrel is that it runs true. In that respect, there is little to choose between the different brands, so if you are on a budget, selecting the cheapest mandrel is as good a course of action as any. Do avoid cheaply made imported 'fakes' of the known brands, however, as these are often poor quality. If the price looks too good to be true, then it probably is. Adjustable mandrels - where the length of the shaft can be varied to suit the components - are a good choice as they enable the mandrel to be kept as short as possible, thus minimising run out and whip. 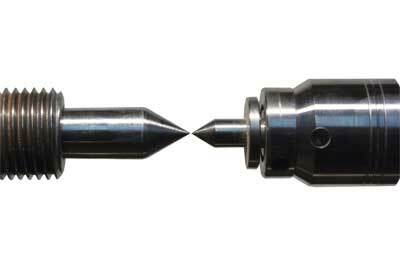 Those with collet-type chucks are the best and most accurate of all. 3. Do I need different bushes for each type of kit? 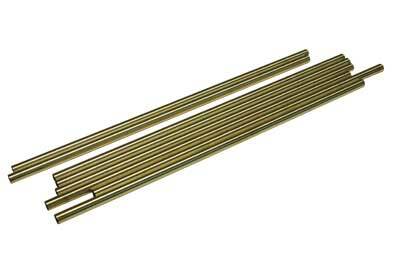 The sizes of the brass tubes and the diameter of the fittings varies considerably between kits, so you will need to use bushes that match the kit you are making. As your skill at turning develops, you will eventually be able to turn without bushes or a mandrel - see question 16 for more information - but using the bushes as a guide is highly recommended, especially for beginners. 4. What are the easiest kits to start with? Pens with simple designs and straight barrels are easiest to turn. Most beginners start with the ubiquitous slimline kits, which are cheap and readily available but others, such as the Sierra and Bolt action pen with single barrels, are easy to make too. Try to avoid kits that require you to cut away part of the barrel back to the tube or to turn a tenon in order to fit components until you have mastered the simple types. 5. Are fountain pens more difficult to make? Fountain pens tend to come with more parts and can be complicated to assemble, but most suppliers have now recognised the need to supply instructions. Turning the barrels for fountain pens is no more difficult than for other pens; it is the alignment of the grain of the barrels on the two halves of the pen and the alignment of the clip with the nib on pens with postable caps that requires the most careful work. 6. Which kits are the best? The range of kits available now is vast and there is considerable variation in quality. 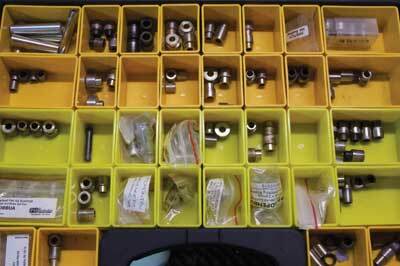 Better quality kits generally have higher-quality platings, such as titanium, rhodium or platinum and can be quite expensive while dubious quality slimlines of Far Eastern origin can be had for little more than Â£1 each. Do not be fooled into thinking that 24 carat gold is the best quality plating because it is in fact so soft that it will wear away very quickly. 10 carat or those described as 'upgrade' plating will be more durable. When choosing between similar looking kits look out for cheap copies, which will often have poorly fitting parts. Exceptionally low price usually means exceptionally low quality. 7. 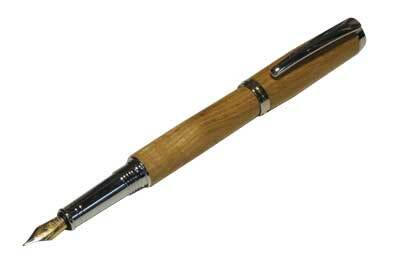 What are the best woods for making pens? Obviously, the best woods are the ones that make the most attractive pens, but the most attractive woods are often not the easiest to work with. Highly figured burrs can contain voids and variations in texture that require filling. 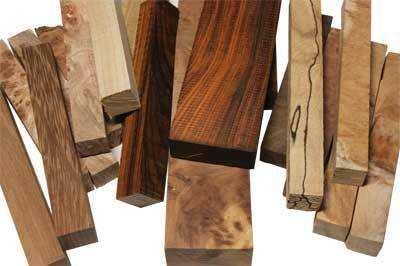 They can also make turning difficult while some exotics such as snakewood (Brosimum guianense) and African blackwood (Dalbergia melanoxylon) can be brittle and prone to splitting if great care is not taken when working with them. Spalted woods can also be attractive but may have soft punky areas that require stabilising by soaking with CA glue in order to make them usable. When starting off, it is perhaps best to use easier to work timbers, such as fruitwoods, and then experiment as your skills develop. Another thing to be wary of is the risk of toxic timbers and those which can cause allergies. I have an allergy to cocobolo (Dalbergia retusa) and need to use respiratory protection if I go anywhere near it. An online search for 'toxic woods' will provide lists of those most likely to cause problems. 8. What gouges and chisels do I need? 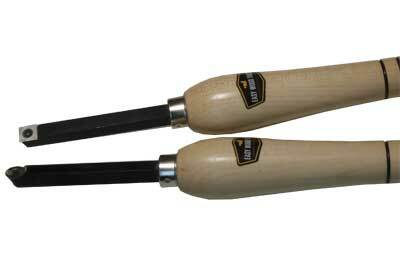 Choice of tools is a very personal decision and every turner will have their own preferences. I do almost all my work with a 20mm or 25mm spindle roughing gouge, turning to a skew chisel or parting tool as required. These three tools will serve the beginner well, but you may prefer smaller tools, in which case, tools specially designed for pen turning may suit you better. Try to handle the tools and see what you feel comfortable with before committing to a purchase. For those with an irrational fear of skew chisels, tools such as the skewchigouge or Spindlemaster will do the job well enough, but I thoroughly recommend taking tuition from an expert in the use of the skew as it is capable of producing much finer results. 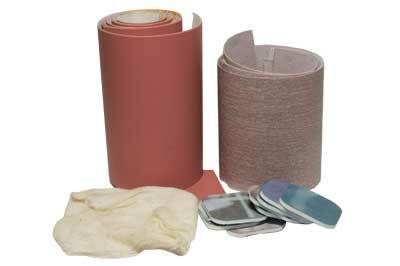 With practice, the skew can produce a finished surface that requires little or no sanding. 9. Do I need different tools for acrylic blanks? 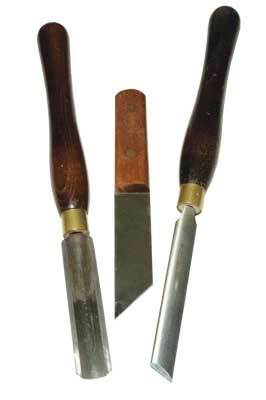 Most man-made materials and blanks that have been cast using polyester resin can be turned with the same tools that are used for timber, but the newer tools with interchangeable carbide tips, such as the Easy Wood Tools and Sorby Turnmaster, are excellent choices for use with these materials. Negative-rake scrapers such as the Robert Sorby hardwood scraper will also work well. It is even possible to turn soft metals, such as aluminium and brass with HSS and carbide-tipped woodturning tools, but if you plan to work with these materials, you would really be better off with a metalworking lathe and the appropriate cutting tools. 10. What other tools and equipment do I need? Before you can begin turning you will need to cut the blanks to size, drill them to take the tubes and square off the ends. Cutting ready-made pen blanks to length can be done with hand saws or almost any kind of powered saw you can think of, but if you wish to resaw your own blanks from larger stock, then a bandsaw will be a good investment. Drilling is covered in question 15 while trimming the ends square may be done with either a dedicated barrel trimmer or a disc sander and jig. When choosing a barrel trimmer, one with interchangeable shafts to fit different-sized tubes will be a good choice. You will also need a means of pressing the components together to assemble the finished pen - see question 18 for more details. 11. 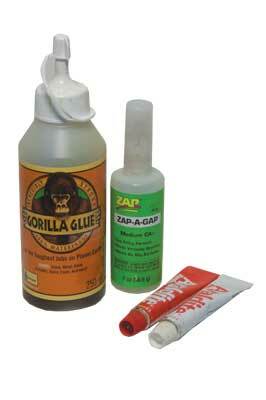 What glue should I use for the brass tubes? 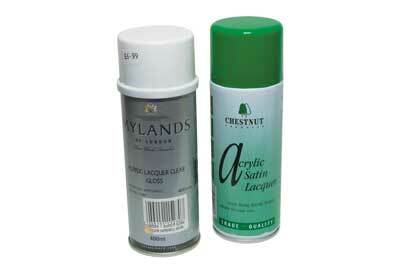 Most pen makers use cyanoacrylate adhesive (CA). I used this myself for many years and it does the job very well. The medium or thick varieties are best. Nowadays, I always use two-part epoxy adhesive as this gives a longer open time when assembling the tubes, has better gap filling qualities and, in my opinion, provides a better and more permanent bond. It is also worth mentioning that polyurethane adhesives will expand to fill any gaps and will work quite well, but care needs to be taken to ensure that the setting adhesive does not push the tubes out of the blanks. Clamping the ends will prevent this. 12. I have read that I should sand the tubes before gluing them. Is this necessary? I had been making pens for about five years before I read that it was absolutely essential to sand the tubes. I experienced no problems in those five years and have never seen the need to change my ways. If you feel the need to do so, then go ahead. It can do no harm, but in my opinion, unless the tubes are greasy and require a wipe with methylated spirit - denatured alcohol - then they require no preparation before gluing. Others will undoubtedly disagree, but I can only speak from my own trouble-free experience with unsanded tubes. 13. When and why do I need to paint the tubes? Many acrylics and other manmade materials are translucent to varying degrees and, especially with lighter colours, the brass tubes can show through, thus spoiling the appearance of the finished pen. 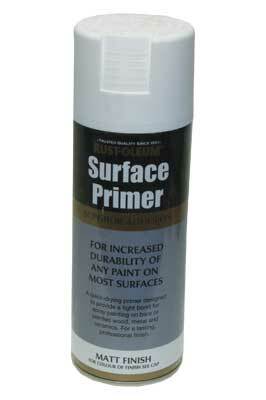 This can be avoided by painting the tubes with a light coloured paint or one that matches the colour of the blank. With very translucent tubes the glue can still show up as unsightly marks so it may also be necessary to paint the inside of the blank. I also sometimes paint the tubes black when working with burrs that contain a lot of voids. That way, the voids can be filled with CA without the brass tube showing through. You could even use a contrasting colour for a more interesting effect. 14. What paint should I use for the tubes? I generally use a white acrylic car body primer when spraying the tubes or ordinary artist's acrylics to paint the inside of the blank. A cheap set of children's acrylic paints from the pound shop will do the job just fine. 15. What is the best way to drill the blanks? 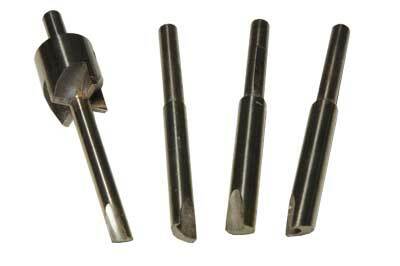 The two main types of problem that occur when drilling pen blanks are either that the drill bit follows the grain and runs out of true, or the blank splits or breaks out. Good drilling practice will prevent this. Do not try to drill freehand or with the blank held in a vice. A drill bit with a guiding point will help keep the drill centred, but by far the most important factors are to keep the drill speed low so as not to overheat the work and to regularly withdraw the bit to clear the chippings or swarf that will otherwise block the flutes. This will inevitably lead to splitting or break-out. Drilling out from the ends of the blanks that will form the centre joint of a two-part pen will help to ensure that the figure or pattern aligns. Initially cutting the blanks over-length and drilling just short of break-out, then trimming to length will help to prevent splitting or break-out in acrylics and the more brittle timbers. 16. What is 'between centres' turning? With a dead centre fitted in the headstock and a live centre in the tailstock, it is possible to mount the blank - either with or without bushes - between the centres and turn without the use of a mandrel. 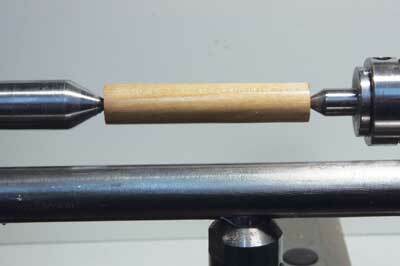 This is the most accurate way of pen turning and many experienced pen makers prefer it. 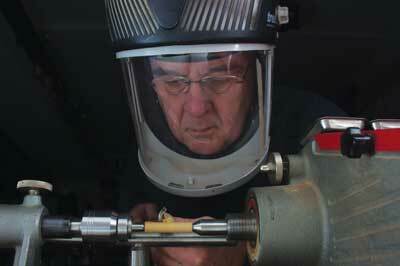 If you work without bushing, you will need a Vernier or digital calliper and the skill to turn to size accurately. 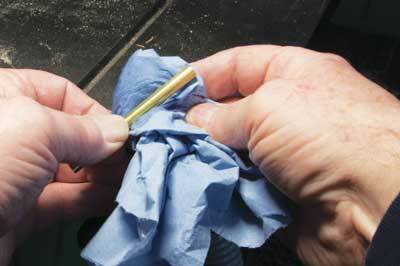 Mounting between centres when finishing is also a useful way of preventing the finish from sticking to the bushings. 17. What kind of abrasive is best? 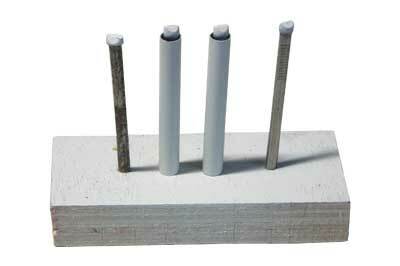 The most frequently used abrasives are aluminium oxide on cloth or foam backings in grits from about 120 to 600, which is best for initial finishing of both timber and acrylics. You can then move on to Micromesh, available in grits from 1,500-12,000, which is suitable for polishing acrylics and hard finishes, such as CA or lacquer. Just as important as choice of abrasive is method. Work through the grits from coarse to fine - low to high grit numbers - making sure when working with wooden pen blanks, that any rotary scratches are removed along the grain with the same grit before moving on to the next. Neglecting to do this correctly will only make for a poorly finished pen. Whatever material you are using, clear away the dust and abrasive particles with a brush or tack cloth before moving on to the next grit. 18. Do I need a pen press? You certainly need something to press the components together and a pen press is a very good way of doing this, but it is not the only way. You could use a bench vice or a large engineer's vice, protecting the jaws of the former from being damaged by the metal components with plywood or MDF inserts and the pen components from damage from the jaws of the latter with rubber or fibre jaw protectors. Alternatively, you could make or buy inserts to fit in the Morse tapers of the lathe and press the components together using the tailstock as a press. 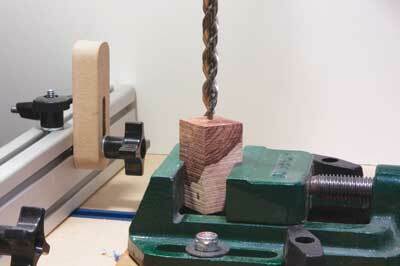 A pillar drill could be used in a similar way. 19. What is the best finish for pens? If you ask 100 pen makers this question, then you will get 100 answers. I covered the range of finishes and their advantages and disadvantages more extensively in my article in issue 264, but the most popular choices are friction polish, CA or a hard acrylic or melamine lacquer. Any of these will do the job, but experiment to see which you prefer. Acrylic and resin cast blanks do not need an applied finish; they are just polished with fine abrasives such as Micromesh or polishes, such as burnishing cream or metal polish. 20. I have messed up, what do I do now? 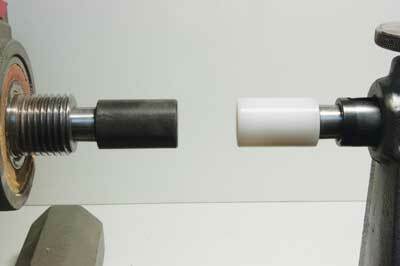 It is extremely likely that, at some stage, you will end up with a tube glued half in and half out of the blank, a blank that splits as you turn it or as you assemble the pen, or that you will assemble the pen only to find that the fit is poor or you have missed out a vital part, which is usually the clip. There is no need to give up or throw away the kit at this point. Damaged blanks can be returned to the lathe and turned away and the tubes cleaned up and reused while assembled pens can be dismantled with a set of transfer punches and the blanks reworked or replaced and omitted parts fitted. If the worst comes to the worst and the brass tubes are rendered unusable, then replacements are readily available for many kits while whole lengths of 7mm tubing are available to make your own for the popular slimline pens.